Power steering makes driving your bus easier, faster and lighter. What if you could drive your business easier, faster and lighter too? Find out how other bus operators are uncovering efficiencies in their business today and getting ready for tomorrow with technology! And as a result got their business future-ready and acquisition-ready. We were just hanging in there at the size that we were. We knew that if we wanted to get any bigger, we needed to change the system. It wasn't sustainable." 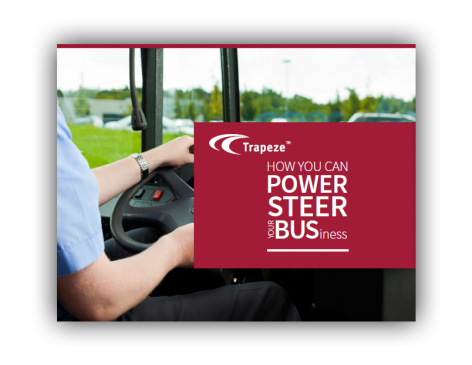 Trapeze’s Enterprise Resource Planning (ERP) solution was created specifically for bus so you can manage your entire bus operation in a single piece of software. It possesses traditional ERP software competencies such as finance, payroll and reporting, as well as bus-specific capabilities for workshop, dispatch and fleet management. Say goodbye to tedious double data entry, manual processes and human error. With the Trapeze ERP, you’ll enjoy seamless communication of information across the business and gain time and money back to spend on more productive, value-added activities.